An instrument dating back to the Inca Empire, this panpipe features eleven reed tubes of graduated length are bound by colorful textiles. 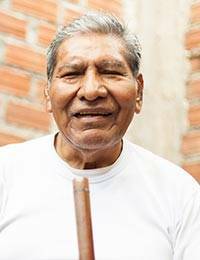 Known as a zampoña, this traditional Andean panpipe is handcrafted by Benito Tito. Selecting the reeds according to size, Tito sands them and aligns them with precision. They are held in place with nylon monofilament and covered with synthetic fabric. A matching fabric case is included; it emulates pre-Hispanic textiles.